Advertise your business to thousands of potential customers each year on the DiscoverCanalFulton.com web site. 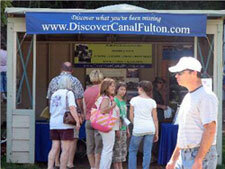 Our audience includes visitors to Canal Fulton (individuals, families, tour groups, etc.) as well as residents of Canal Fulton (who visit our web site regularly for the latest community information). Our mix of viewers affords advertising opportunities to many types of companies, including those seeking customers visiting Canal Fulton and those catering to the needs of the residents of Canal Fulton. 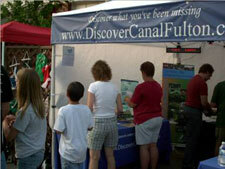 The web site DiscoverCanalFulton.com averages over 250 viewers per day that also view an average of three pages per day, looking for information about Canal Fulton. All of which help more people see your marketing message when placed on our web site. PLUS a Banner Advertisement Placed on our Home Page! Watch for other times and locations coming soon. Please support our site by adding the link below to your web site! Is your web site tired and old? Do you need someone to maintain your site? Discover Canal Fulton now offers a complete Web Maintenance package. This package includes updates to your sites layout, content and graphics. Discover Canal Fulton can also create a complete Content Management System for your site to allow you to handle all your Web Site updates yourself, without programming.